Then, in explaining the ruling, Fischer wrote that unlike a foul ball or a T-shirt shot into the stands (the Reds use a contraption nicknamed “Redzilla” to fire free T-shirts into the crowd) that fans have no expectation of receiving, they buy tickets for games that have been advertised as bobblehead games expecting to get the bobbleheads, which last season included All-Stars Joey Votto and Eugenio Suarez. “We accordingly conclude that the promotion items constituted things of value in exchange for which fans paid money that was included in the ticket prices,” the opinion stated. Dissenting Justice Mary DeGenaro wrote that the Reds were escaping sales tax or use tax on promotional items that generally apply to similar purchases. 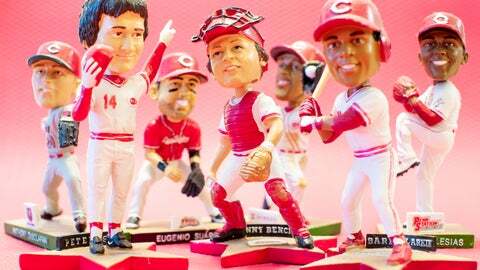 She pointed out that the Reds often limit the promotional items, such as free to the first 30,000 fans. She said a Reds official had testified that the Reds would “make accommodations” to remedy the situation, up to offering refunds to fans who complain about missing out.